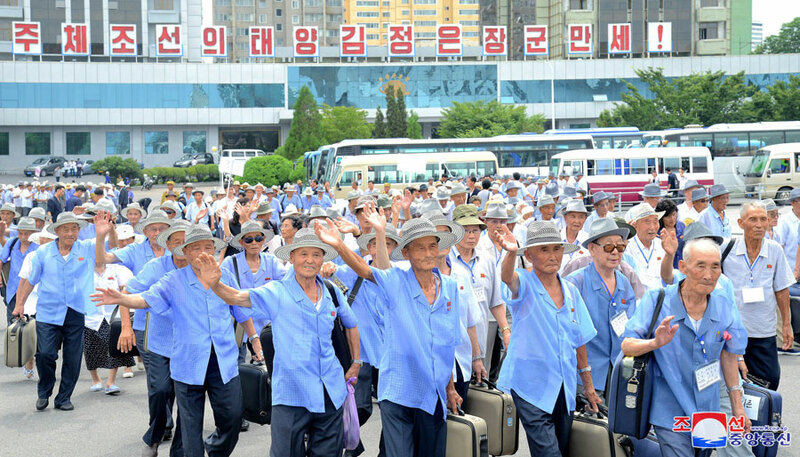 DPRK war veterans arrived in Pyongyang on July 25 (Tuesday) from around the country to attend the 5th National Conference of War Veterans and other events in Pyongyang. 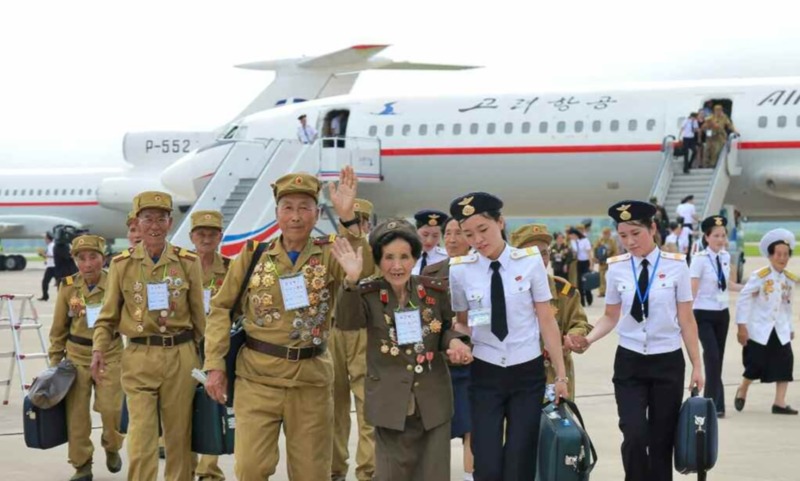 War veterans from Yanggang, North Hamgyo’ng and Raso’n City arrived in Pyongyang via charter flights and veterans from North and South P’yo’ngan, Chagang, North and South Hwanghae, Kangwo’n, South Hamgyo’ng and Nam’po arrived via train and bus. War veterans participating in the 5th Conference of War Veterans arrive at Pyongyang Central Railway Station on July 25, 2018 (Photo: Rodong Sinmun). 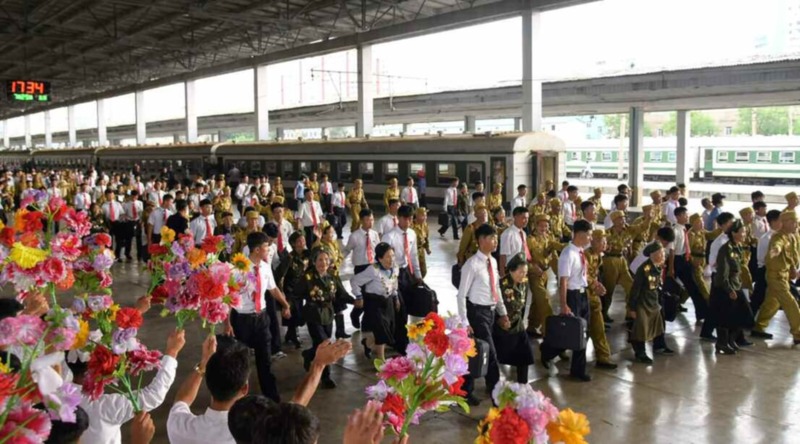 War veterans arrive in Pyongyang on July 25, 2018 (Photo: KCNA/Rodong Sinmun/KNS). The war veterans were escorted and assisted by members of the Youth League and greeted, at their respective places of arrival, by senior Workers’ Party of Korea and DPRK Government officials including WPK Vice Chairmen Pak Kwang Ho (Pak Kwang-ho), An Jong Su (An Cho’ng-su), Pak Thae Song (Pak T’ae-so’ng) and Choe Hwi. 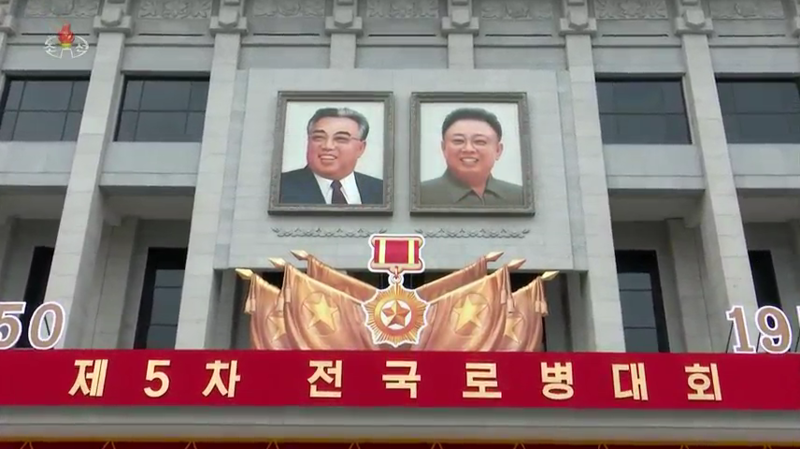 Kim Il Sung and Kim Jong Il portaits outside of the venue of the 5th Conference of War Veterans, the April 25 House of Culture (Photo: KCTV). 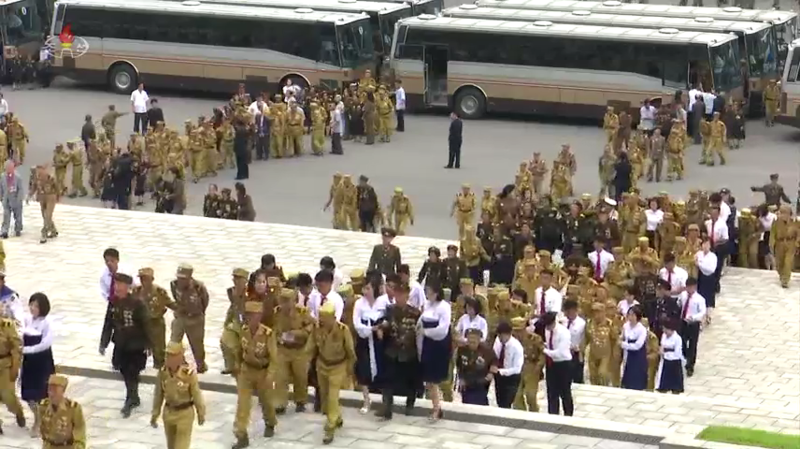 War veterans and other participants arrive for the conference in Pyongyang on July 27, 2018 (Photo: KCTV). 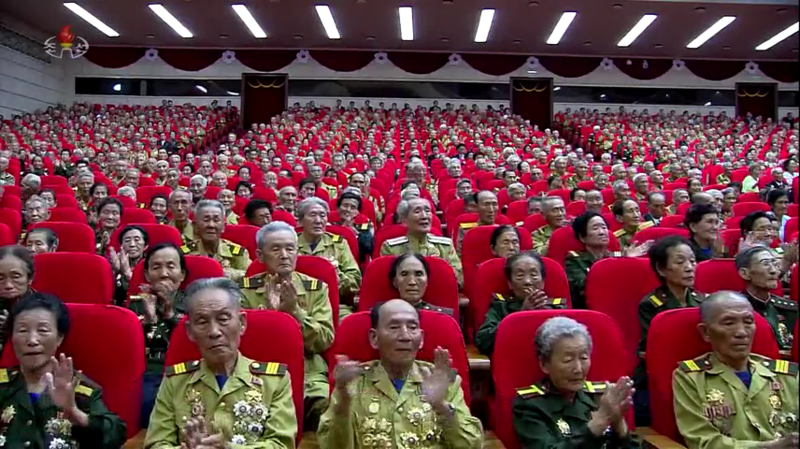 Senior WPK Central Committee officials visited the war veterans and conference participants during the morning of July 26 (Wednesday). Among the senior cadres traipsing to the various accommodations were WPK Vice Chairman and Director of the WPK Propaganda and Agitation [Publicity and Information] Department Pak Kwang Ho, WPK Vice Chairman for Workers’ and Social Organizations Choe Hwi (Ch’oe Hwi) and WPK Vice Chairman for General Affairs Pak Thae Dok (Pak T’ae-tok). 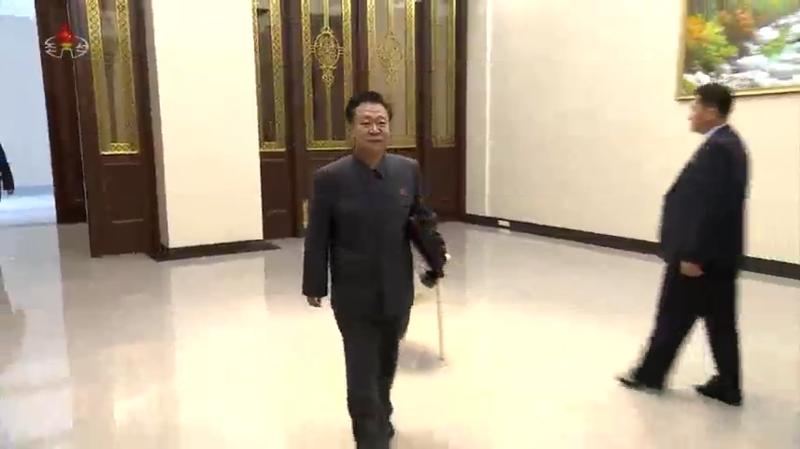 Workers’ Party of Korea Vice Chairman, State Affairs Commission Vice Chairman and WPK Political Bureau Presidium Member Choe Ryong Hae arrives at the April 25 House of Culture in Pyongyang to preside over and speak at the 5th Conference of War Veterans (Photo: KCTV). 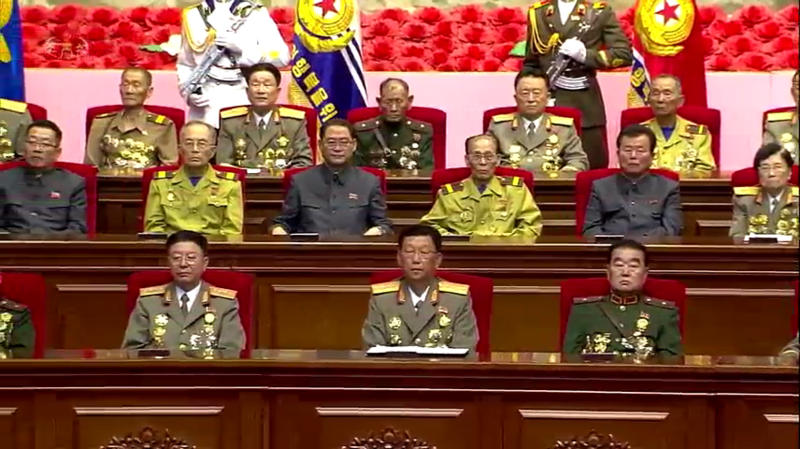 Current senior DPRK officials and retired members of the core leadership who are war veterans arrive to the platform for the conference including VMar Ri Yong Mu (5th right), Choe Yong Rim (4th right) and Gen. O Kuk Ryol (2nd right) being assisted to his chair (Photo: KCTV). 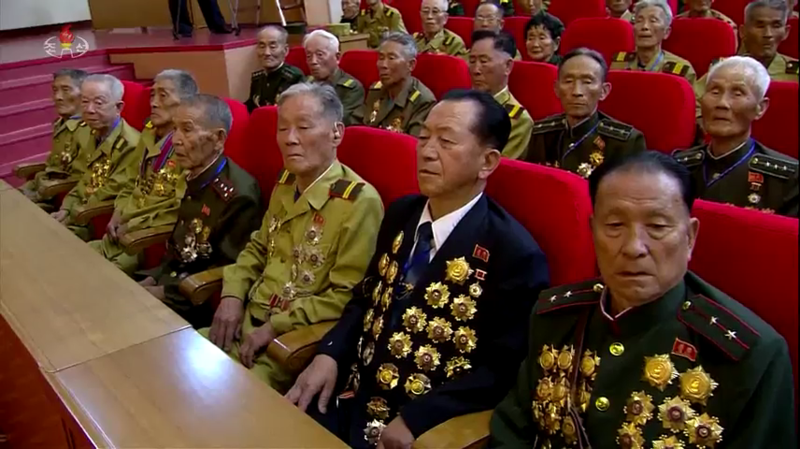 The surviving members of the 88th Sniper Brigade of the Soviet Army Far East Command (of which Kim Il Sung was a member to which his partisan guerrilla unit was consolidated: Hwang Sun Hui (left), Kim Chol Man (center) and Ri Yong Suk (right) sitting front and center on the platform of the 5th Conference of War Veterans (Photo: KCTV). 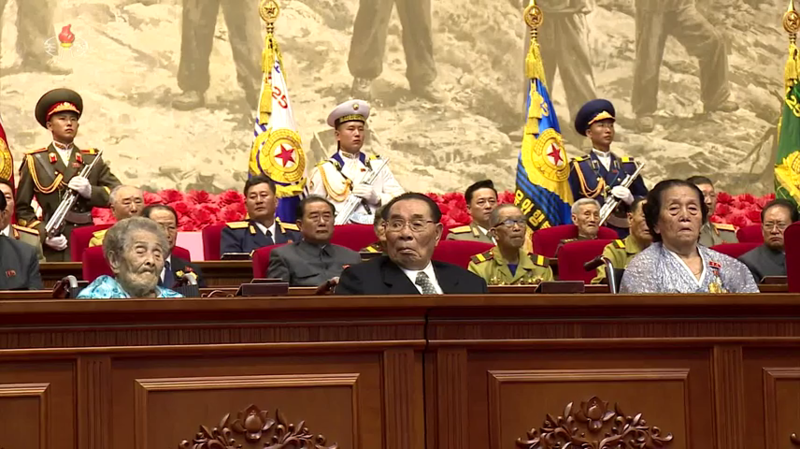 The 5th National Conference of War Veterans was held at the April 25 House of Culture in Pyongyang on July 27 (Thursday) to commemorate the 65th anniversary of the termination of active hostilities of the Fatherland Liberation War (Korean War). 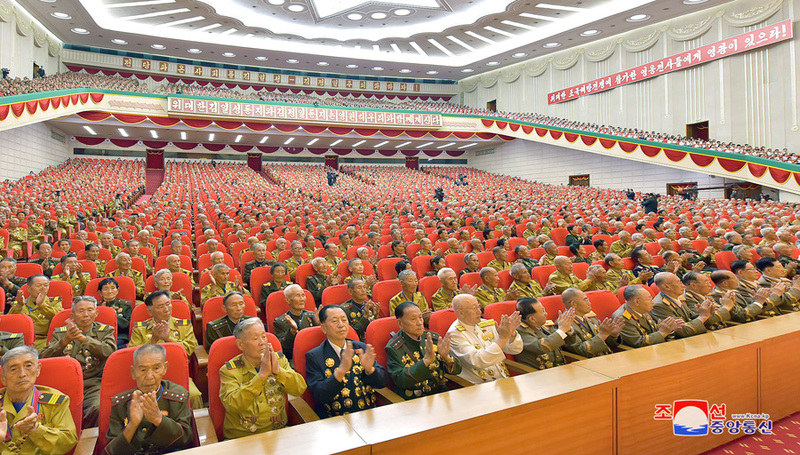 View of the venue and platform of the 5th Conference of War Veterans in Pyongyang on July 28, 2018 (Photo: Rodong Sinmun). 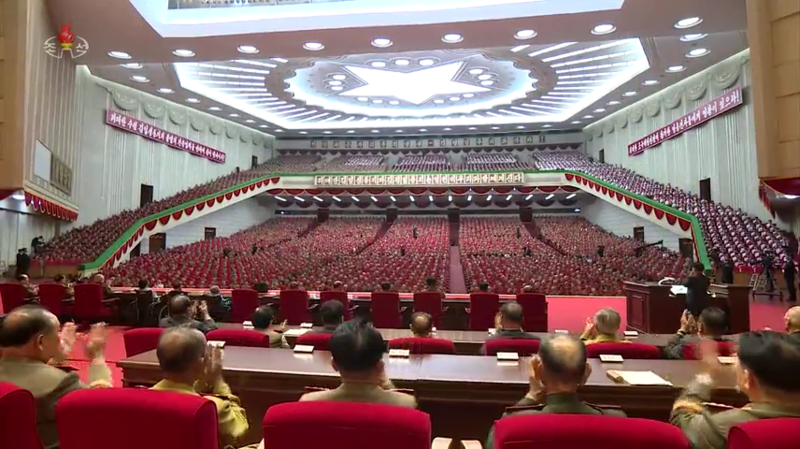 View of the right side of the conference platform (Photo: KCTV). Among those in attendance were: Honorary Curator of the Museum of the Korean Revolution, member of the 88th Sniper Brigade and widow of Ryu Kyong Su, Hwang Sun Hui (Hwang Sun-hu’i); former Chairman of the Second Economy Commission (Second Economic Committee) and member of the 88th Sniper Brigade Kim Chol Man (Kim Ch’o’l-man); member of the 88th Sniper brigade and friend of Kim Jong Suk (Kim Cho’ng-suk), Ri Yong Suk; Supreme People’s Assembly (SPA) Presidium Vice President and Korean War veteran (rear area) Yang Hyong Sop (Yang Hyo’ng-sop); immediate past Chief of the Korean People’s Army (KPA) General Staff Department and Korean War veteran (combat) VMar Ri Myong Su (Ri Myo’ng-su); WPK Vice Chairman and Director of the WPK Munitions Industry Department and Korean War veteran (rear services) Thae Jong Su (T’ae Cho’ng-su); Honorary SPA Presidium Vice President, former DPRK Premier and Korean War veteran (as a rear area body guard to the Kim Family) Choe Yong Rim (Ch’oe Yo’ng-rim); former National Defense Commission (NDC) Vice Chairman, former KPA General Political Bureau Director and Korean War veteran (combat) VMar Ri Yong Mu (Ri Yo’ng-mu); former National Defense Commission Vice Chairman, former Chief of the KPA General Staff Department and Korean War veteran (combat), Gen. O Kuk Ryol (O Kuk-yo’l); former Kim Il Sung Higher Party School President and Rector and Korean War veteran (combat) Kim Si Hak; Korean War veteran (combat) and former Korean People’s Internal Security Forces Political Director Col. Gen. Ri Pyong Sam (Ri Pyo’ng-sam), along with veterans of the Korean War and KPA support and advisor missions in other conflicts abroad. 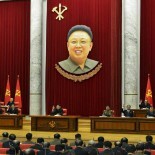 Among those attending the conference on the platform from the central leadership were: WPK Vice Chairman and State Affairs Commission Vice Chairman Choe Ryong Hae (Ch’oe Ryong-hae); KPA General Political Bureau Director Gen. Kim Su Gil (Kim Su-kil); Chief of the KPA General Staff Department Gen. Ri Yong Gil (Ri Yo’ng-kil); Minister of the People’s Armed Forces Gen. No Kwang Chol (No Kwang-ch’o’l); WPK Vice Chairmen Pak Kwang Ho, Pak Thae Song, Choe Hwi and Pak Thae Dok; WPK Vice Chairman and WPK Cadres’ Affairs Department Director Kim Phyong Hae (Kim P’yo’ng-hae); WPK Vice Chairman for Economic Affairs O Su Yong (O Su-yo’ng); WPK Vice Chairman and WPK Light Industry Department Director An Jong Su (An Cho’ng-su); Guard Command Director Gen. Yun Jong Rin (Yun Cho’ng-rin); 1st Vice Minister of the People’s Armed Forces and KPA General Logistics Department Director Gen. 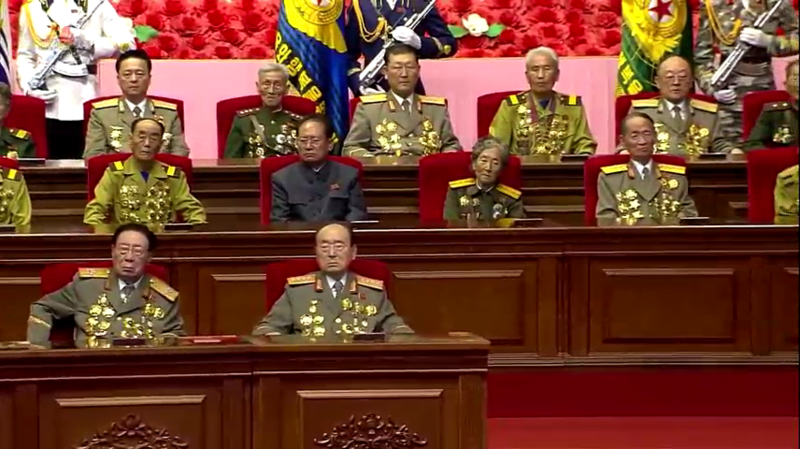 So Hong Chan (So Hong-ch’an); Vice Minister of the People’s Armed Forces Col. Gen. Yun Tong Hyon (Yun Tong-hyo’n); Vice Chief of the KPA General Staff Department Gen. O Kum Chol (O Kum-ch’o’l); Vice Minister of the People’s Armed Forces Col. Gen. Kim Hyong Ryong (Kim Hyong-ryong), KPa Navy Commander VAdm Kim Myong Sik (Kim Myo’ng-sik); and, WPK Central Military Commission Member and semi-retired WPK Organization Guidance Department Senior Deputy Director Kim Kyong Ok (Kim Kyo’ng-ok). 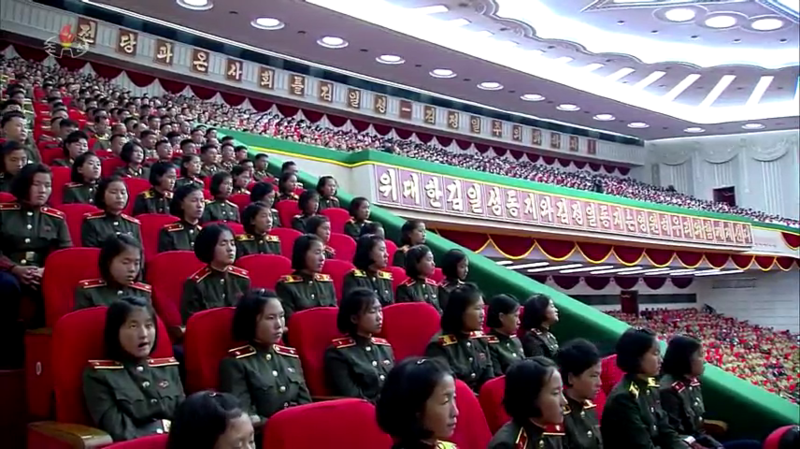 Cadets of the Kang Pan Sok Revolutionary School sit in the mezzanine as observers to the 5th Conference of War Veterans (Photo: KCTV). Attending the conference as observers were senior cadres and functionaries of DPRK Cabinet ministries, national institutions, the KPA and Korean People’s Internal Security Forces, students of Mangyo’ngdae and Kang Pan Sok Revolutionary Schools and students and young people living in Pyongyang. 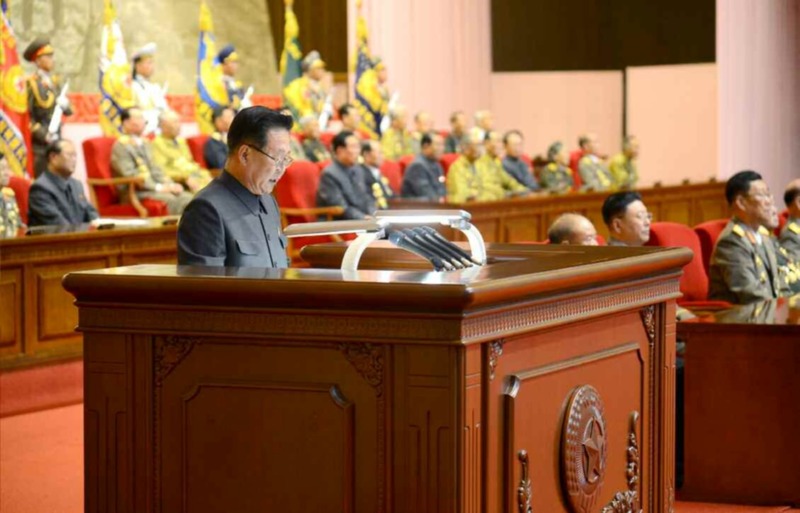 Choe Ryong Hae reads out the report during the conference (Photo: Rodong Sinmun/KCNA). 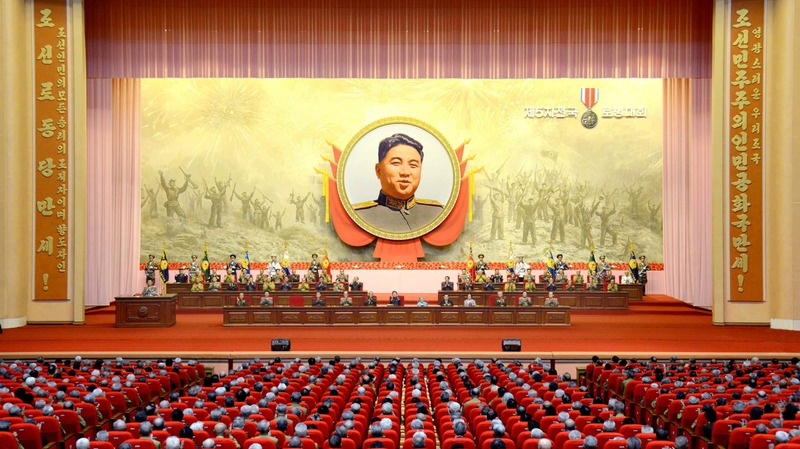 The conference is a significant one for congratulating the second generation of the revolution, elder revolutionaries who performed undying feats in defending the country and building socialism true to the leadership of President Kim Il Sung (Kim Il-so’ng) and leader Kim Jong Il (Kim Cho’ng-il) and for demonstrating the will of the new generations to demonstrate the strong spirit of Chuch’e Korea by carrying forward the soul of the victors of great years. As there was the generation who won the great victory in the war in three year do-or-die battles day and night both on front and in rear, the Democratic People’s Republic of Korea, the people’s country, has towered as the invulnerable fortress and the true appearance of heroic Korea and heroic people has shined all over the world. 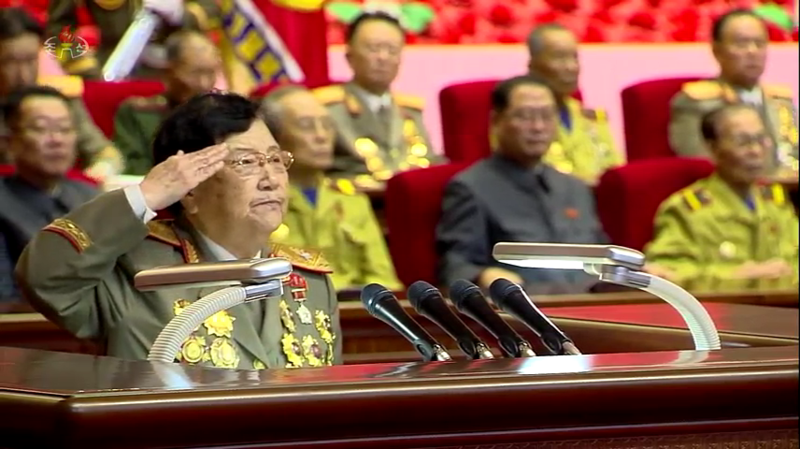 Victorious Fatherland Liberation War lecturer Jon Ku Gang salutes during her speech to the conference (Photo: KCTV). 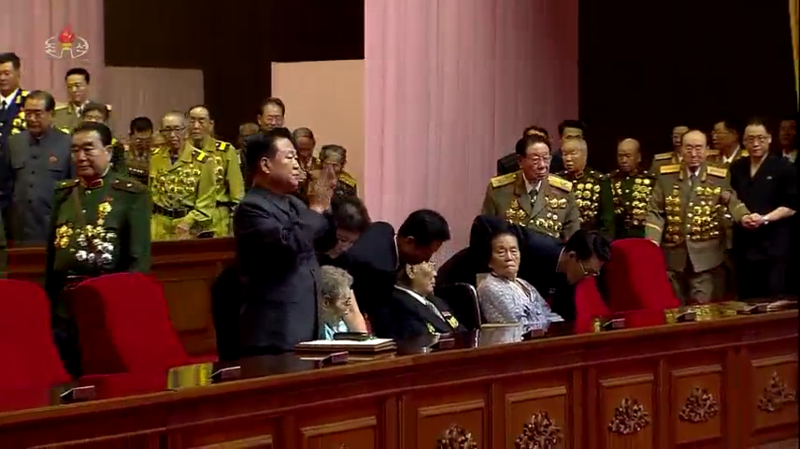 Victorious Fatherland Liberation War Museum Lecturer Jon Ku Gang (Cho’n Ku-kang) made a “request for rising generations on behalf of the war veterans” in her speech. 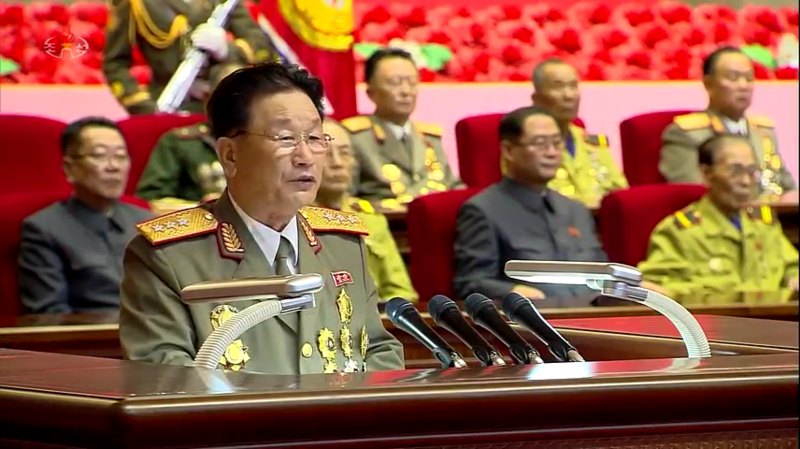 Pledge speeches were also delivered by Commander of the 105th Tank Corps Col. Gen. Kim Song Chol (Kim So’ng-ch’o’l), speaking on behalf of the KPA and 1st Secretary of the Youth League Central Committee Pak Chol Min (Pak Ch’o’l-min), who spoke on behalf of youths, students and the Young Red Guards. 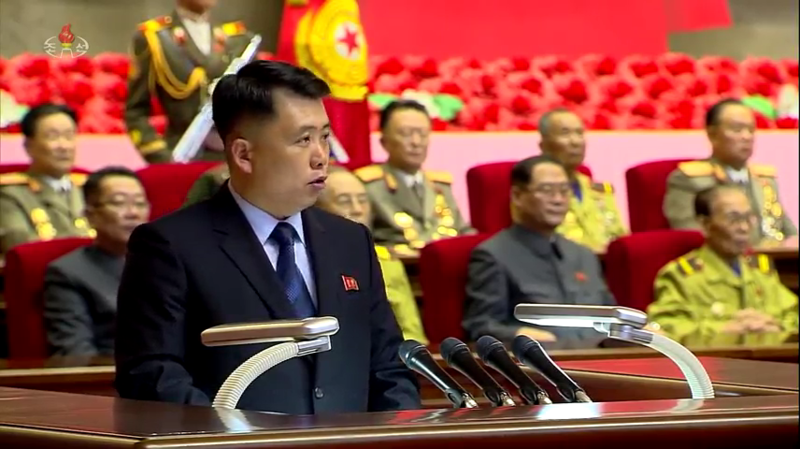 Youth League 1st Secretary Pak Chol Min speaks on behalf o young people and students at the end of the 5th Conference of War Veterans (Photo: KCTV). This article was written on 28 Jul 2018, and is filled under 2007-2010 kpa management, An Jong Su (WPK LID), Cadre Affairs, Central Committee, Central Military Committee, Central Party Affairs/Cadres 5th Section, Choe Hwi (PAD], Choe Ryong Hae, Choe Yong Rim, Col. Gen. Kim Hyong Ryong, Col. Gen. Kim Song Chol, Col. Gen. No Kwang Chol (KPAGS), Col. Gen. O Kum Chol, Col. Gen. Ri Pyong Sam, Col. Gen. So Hong Chan, Col. Gen. Yun Tong Hyon (MPAF), DPRK Cabinet, DPRK-China Relations, Executive Policy Bureau, Fatherland Liberation War (Korean War), Gen. Ri Myong Su, Gen. Ri Yong Gil, Gen. Yun Jong Rin, Gen. Yun Tong Hyon, General Affairs, General Federation of Trade Unions of Korea, gsd, gsob, Guard Command, ideological slogans, Information Section, Kim Chong-un inspections, Kim Family, Kim Il Sung Youth League, Kim Jong-il, Kim Jong-un, Kim Kyong Ok (OGD), Kim Phyong Hae (Cadres/NPYPPC), kisyl, KJI Personal Secretariat, KJI/KJU Ideological Works, Korean Democratic Women's Union, Korean People's Air Force, Korean People's Air Force [KPAF], Korean People's Army Air Force, Korean People's Internal Security Forces, Korean People's Army (KPA), Korean Workers' Party (KWP), KPA General Political Bureau, KPA General Political Department, KPA General Staff, KPA in Vietnam War, KPA Party Life, KPA supernumerary organizations, KPA WPK Committee, kpif, Lecture Guidance, local people's committees, Lt. Gen. Kim Su Gil, Machine Building Industry Department, Military Affairs, military security command [msc], ministry of people's security, Ministry of State Security, Ministry of the People's Armed Forces (MPAF), MPAF GPB, MPAF Revolutionary Museum, National Defense Commission (NDC), Navy Command, North Korean press, O Kuk Ryol, O Kuk-yol, O Su Yong, Organization and Guidance Department, Pak Chol Min [KISYL], Pak Kwang Ho (PAD), Pak Tae Dok (N. Hwanghae WPK), Pak Thae Song (KWP CC Dept), Party elders, Party History Institute, party life, Party Life Guidance, Political Bureau, Propaganda and Agitation Department, Provincial Party Committees, Provinicial People's Committee, Public Events, Public Information Commission, Pyongyang Defense Command, Pyongyang WPK Committee, Second Economy Commission, Secretariat, State Affairs Commission, Supreme People's Assembly, Tae Jong Su, uawk, VADM Kim Myong Sik (KPAN), VMar Ri Yong Mu, Worker Peasant Red Guard, Workers' and Social Organizations, Yang Hyong Sop, Young Red Guard, Yun Jong Rin, Yun Tong Hyon.